Well, Urban Yarns just keeps feeding my SweetGeorgia Obsession! We just got a new shipment from the lovely Felicia and I am so excited. 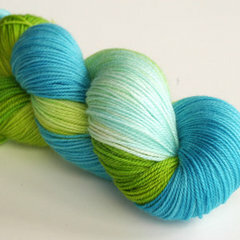 Not only a new yarn, CashLuxe, but new colours in the worsted weight as well, hooray! The CashLuxe is a sumptuous combination of superwash merino, cashmere, and nylon for strength. It’s a sock weight yarn with about 375 yards per skein. One skein makes a a luxurious pair of socks or a small shawl. Small shawls to wear around the neck have been all the rage around UY. A few ladies are working on Ishbel by Ysolda Teague and I’m thinking about casting on for Collonade (based on the lovely one from Kirsten). We’ve got some beautiful colours in the new yarn so pick yourself up a treat! 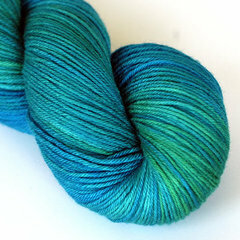 We’ve also got some new colours in the Superwash worsted. I’m a HUGE fan of this yarn and have knit several projects in it. It’s an 18 stitch gauge, so there are tons of patterns for it. I’m particularly interested in the Mr. Darcy cardigan (starting some Christmas knitting for mummy) and I’m itching to make myself a new hat for winter. 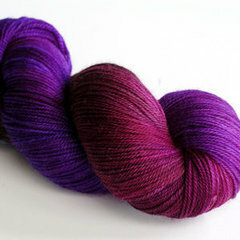 I’m thinking about the beautiful Cypress colourway but Blackberry might sway me in the end. This entry was posted on Tuesday, July 20th, 2010 at 10:06 am	and is filed under Uncategorized. You can follow any responses to this entry through the RSS 2.0 feed. Both comments and pings are currently closed. My Ishbel is loving the blackberry in merino/silk lace. Had to add extra repeats because there was so much yardage.